Strategy and program development for festivals, incubators and community groups. You want to do different things? Then do things differently. Intervene breaks up patterns that build up over time, allowing you to approach challenges from a fresh perspective. Intervene supports new ways of working to apply those perspectives. Disorder - Reorder. Research: We draw attention to the unspoken routines that make transformation difficult. Strategy: We work with you to articulate a point of view that suggests a pattern of advantage. Program Development: We redesign the moments when people come together to align with the point of view. Workshops: We build capacity in your team and community to sustain the change going forward. Existing routines often embody old ways of thinking and working. Strategic disordering and reordering allows for new approaches to emerge and be sustained. New kinds of spaces require new kinds of organization. Our methods draw attention to how you are making sense of yourself, your environment, and the processes by which value is created. We also demonstrate how existing habits lead to cycles of decisions and action that may not be in alignment with project or organizational goals. Until we develop continual awareness of the uncertainty of our environments and the many potential ways of responding to those environments, ongoing change remains difficult and costly. The self-transforming and self-organizing capacities of your organization are already there. Where many organizations need help is viewing their situation from different perspectives - not better ones - but different views that illuminate different opportunities and thereby trigger different decision-making responses. Sometimes it only takes one conversation to uncover the perspectives necessary to take effective action. You want things to be different? Then do things differently. We see strategy as setting a point of view and then coordinating activity to realize a pattern of advantage. We work with organizational and project partners to research, design, deliver, and evaluate new human architectures to respond to current and future needs These designs include how activities are organized, where the work is positioned, how decisions are made, what new products or services are necessary, or even what purpose the organizations serves. We take an experimental approach so that complex interactions can be understood and refined. Intervene's approach allows for evidence to be created and transitions to be visible to more people, while recognizing that human systems are messy and complex. We let you test assumptions before committing time and money. We bring insight to see possible new paths, capacity development to help your people go down them, and impartial judgment to measure results. Our focus is on transitions in human relationships within organizations and with external stakeholders. Intervene serves as a creative partner and project backbone for organizations that want to see a shift in how a system operates and the outcomes that it generates. We design and deliver programs for various stakeholders to improve outcomes and to validate new approaches. Complex issues rely on rethinking the problem and building new systems and relationships, in addition to improving existing ones. The costs of misaligned systems are enormous but hard to quantify. 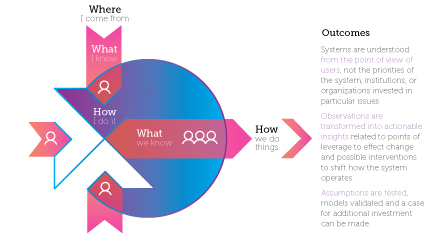 Customized tools allow us to identify and assess impact across several relevant dimensions. Overall, we offer a scalable process for getting people engaged and a framework for developing strategies that can succeed. Vague or fuzzy advances won’t help make the case for change. To be convincing, performance improvements must be clear and concrete. Sponsors, participants and institutions need to see real evidence of the progress and the validity of the change effort. Program success is tied to good design and good storytelling. Broadcast of stories and successes to inspire further action. The best plan in the world is of little use if there are not enough people ready to implement it. Intervene designs and delivers development opportunities for individuals, teams and organizations. Through workshops and leadership development programs, we build the capacity of individuals and teams to find their feet and start moving into complexity. We help our participants operate in spaces where their knowledge is hard to apply. We center systems and systems change. Our methods draw our clients’ attention to how they are making sense of themselves, their environments, and the processes by which value is created. We also demonstrate how existing habits lead to cycles of decisions and action that may not be in alignment with project or organizational goals. Until we develop continual awareness of the uncertainty of our environments and the many potential ways of responding to those environments, ongoing change remains difficult and costly.